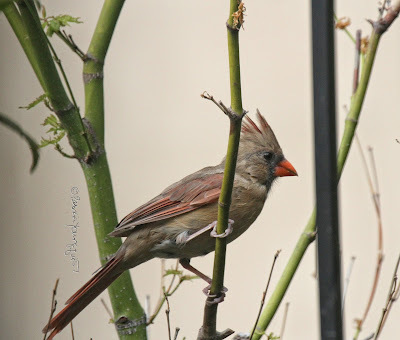 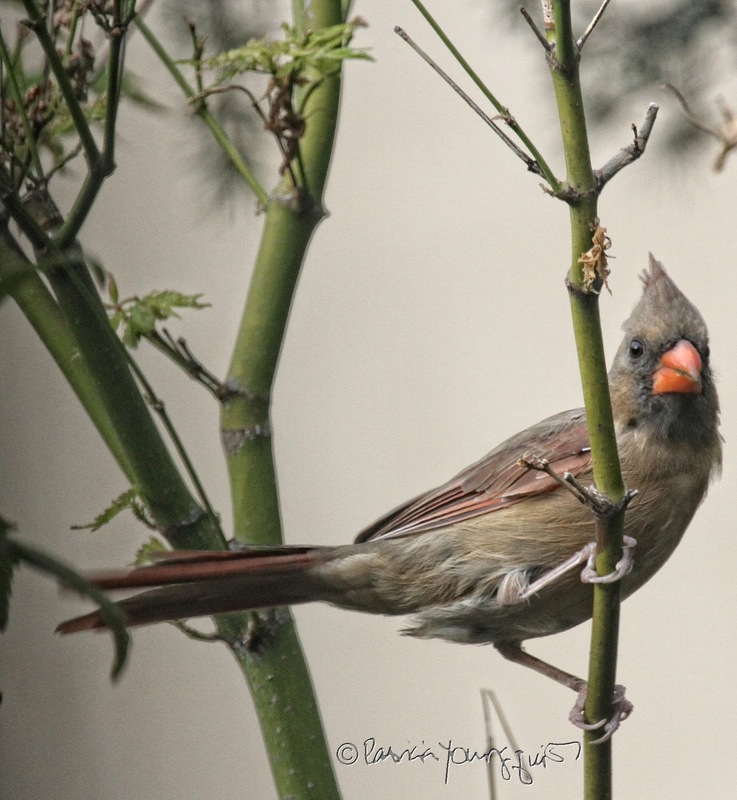 It has been twelve days since I took this picture (above) of a female cardinal (one of Cam's daughters) who was casting her gaze in a very specific manner, as she wrapped her feet around the branches of a tree known by the name of Acer palmatum ('Shisitatsu' Sawa), which grows in my rooftop garden. 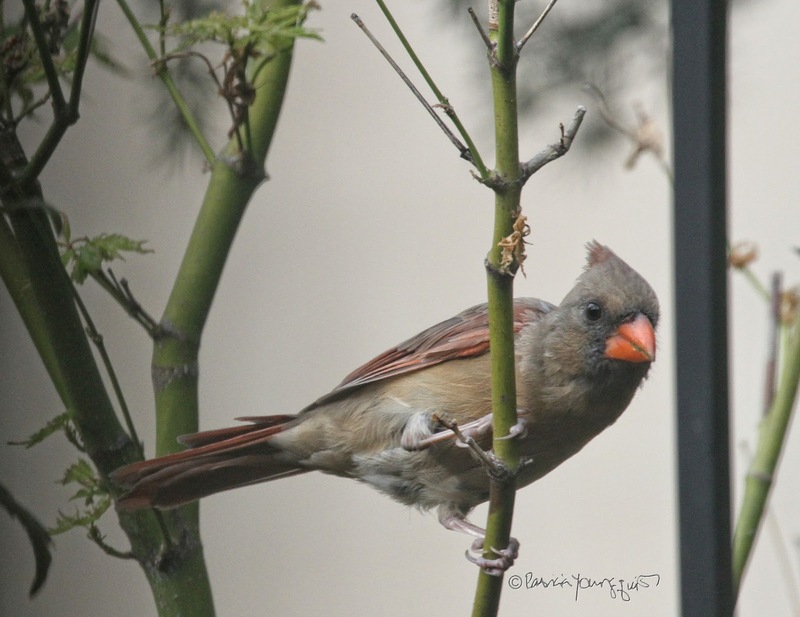 The long lens on my camera, along with a large monitor which is attached to my computer, allowed me to take notice of how this bird used her legs, ankle, and feet, in order to secure this vantage point for a better view of what she was looking at. I was very awestruck by her ability to make use of what she has in order to observe her surroundings, as you might be too upon seeing the next set set of images. 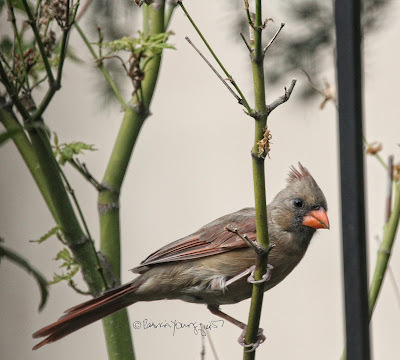 Because her "mohawk" was slightly raised, I believe she may have been a bit apprehensive (or at least very cautious) about what she was looking at, which was probably a bird feeder that is in close proximity to this tree. 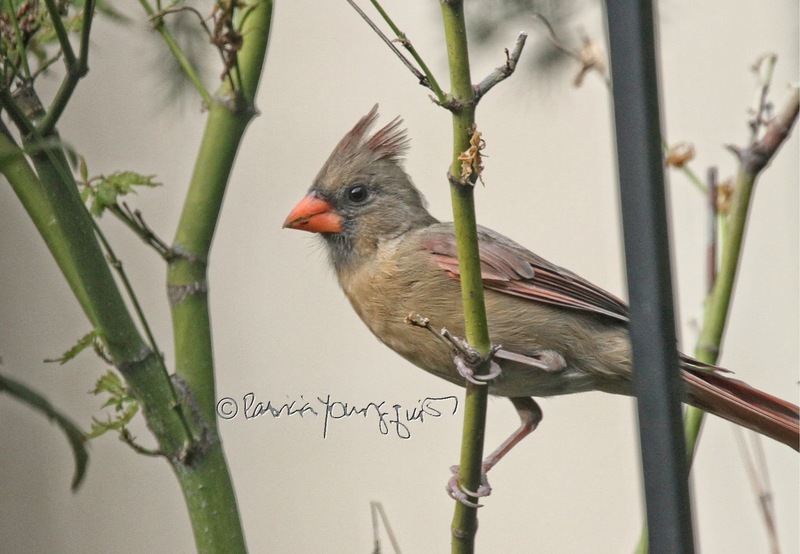 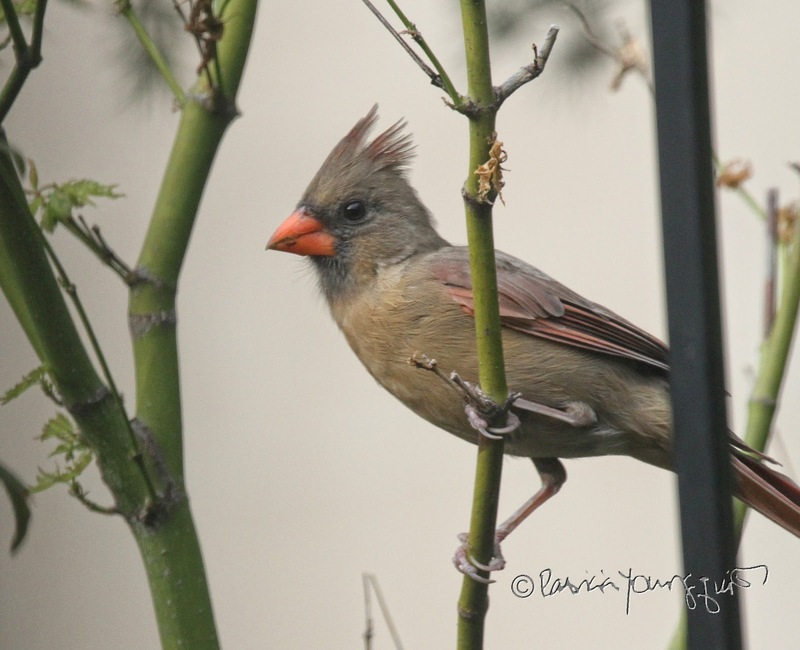 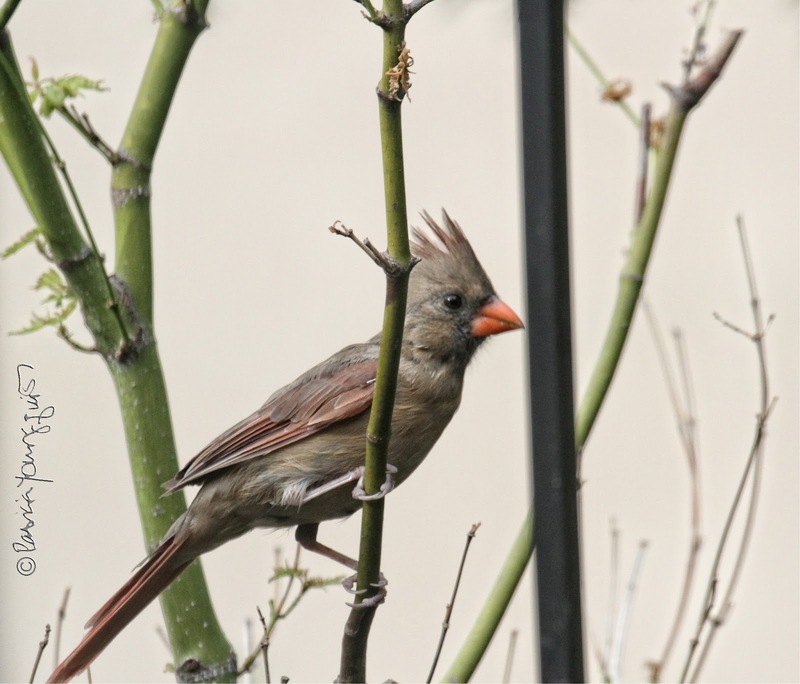 And even when the cardinal whom I've been discussing shifted her gaze, her mohawk remained a bit raised (as seen below). 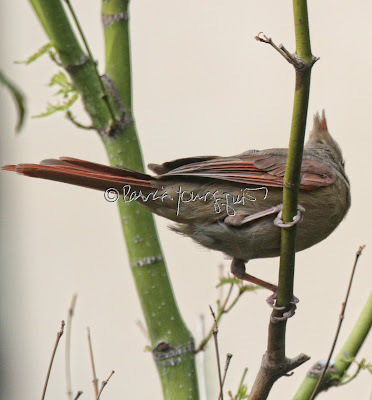 But her feet remained wrapped around the tree's branch, which what intrigued me. 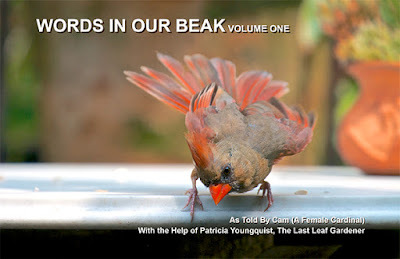 For birds often need to make a fast exit (which is also discussed in WIOB V-1) and that might be hard to do if feet are wrapped around anything. But that didn't seem to worry her, and it seems that I wasn't the only one eye-ing a living being on that October today, for she appeared to switch her gaze towards me, or was that her way of telling me to check the status of the black-oil sunflower seeds? 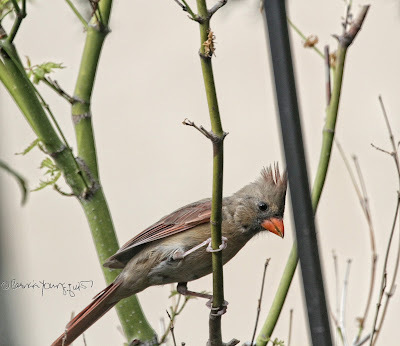 Whatever she was looking at in the image above remains unbeknownst to me, but I do know I am grateful for her visit, for the chance to see her wrapping her feet around the branches of my tree, and also for the opportunity to glance at the coloring of her wings, which you can do too, dear reader, by looking at the next photo. 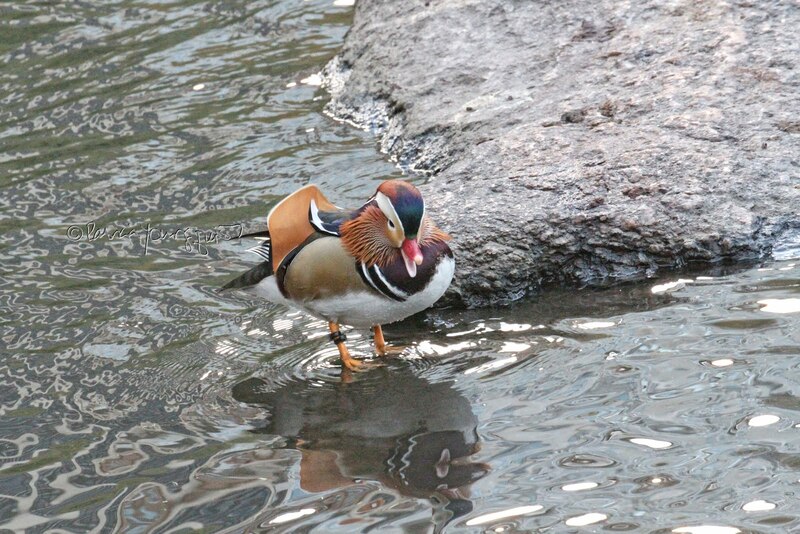 The presence of this lovely creature was truly welcomed on that day (as it always is) and, as you can, surmise, I heeded the wisdom offered in the poem, Invitation, (by Mary Oliver) which is posted directly below. 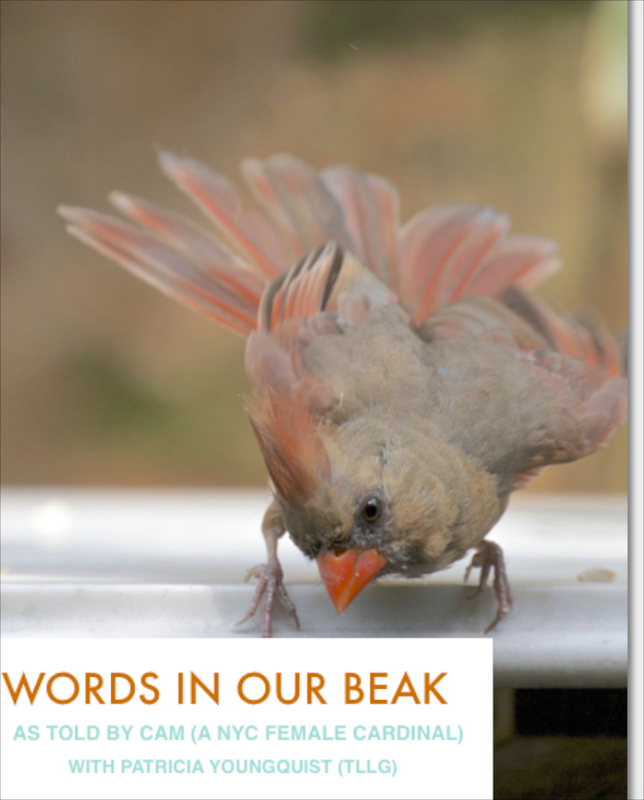 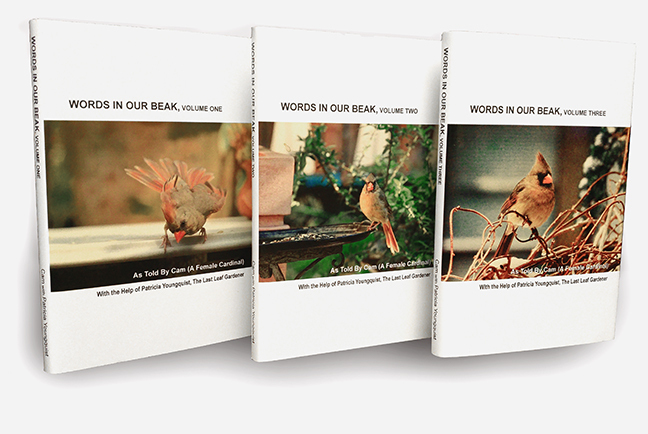 The digital and softcover version of Volume One within the Words In Our Beak book series that are mentioned in this entry may only remain available for a limited time, but hardcover versions of Volume One, Two and Three can now be found wherever books are sold.